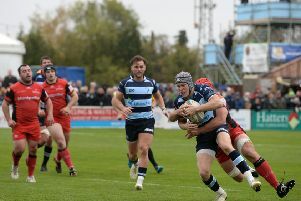 Mike Rayer was pleased to see his Bedford Blues side secure safety for themselves, after their 31-21 victory over Moseley on Saturday afternoon. The Blues went into the match knowing one win from their last three matches would secure safety and two tries from Jake Sharp; as well as one apiece via Nick Fenton-Wells, Pat Tapley and Camilo Parilli-Ocampo, helped secure victory that means relegation isn’t possible going into the final two games of the campaign. “We wanted to keep it in our hands, we didn’t want any favours off anybody and that’s exactly what we’ve gone and done,” stated the Blues head coach. “We put ourselves in a position we didn’t want to be in but credit to the lads to get the win. It was pretty heart-stopping at times but five tries to three was a fair reflection, I think. In a first half that only saw one try being scored by Sharp, the second 40 minutes produced seven five pointers – four of which coming from the home side. We wanted to keep it in our hands, we didn’t want any favours off anybody and that’s exactly what we’ve gone and done. Rayer was unsure as to whether that was down to nerves or just errors, however he was pleased with the players’ character to continue to fight until the end. He added: “We didn’t really create a lot in the first half apart from that one opportunity for Sharp’s score; whether that was down to nerves, apprehension, or just a being a bit clumsy I’m not sure. “The pleasing thing was to hold them out and not let them score, I know he (Hooley) missed his kick just before the break but even if we were 7-12 down I would still have felt confident we would have turned it around. “We made a great start to the second half and showed great character to put ourselves back in front, that’s one thing we were really pleased about because you can’t coach determination or a good attitude but that lads showed that to fight back.